After seven years served for the murder of his foster father, Ciaran Devine is released from the young offenders’ centre where he and his brother Thomas spent their teenage years. Probation Officer Paula Cunningham is assigned his case – a high-profile case at the time of sentencing, though neither Ciaran nor his brother were named at the time – and reaches out to DCI Serena Flanagan, who helped to put the young man behind bars, to get a better feel for what she can expect. Flanagan is convinced of Ciaran’s innocence, believing that he covered for his older brother. Now that he is back on the street, the women are convinced that he is falling into his old ways, being led astray by Thomas. When the son of the man they murdered – who shares Flanagan’s belief in Ciaran’s innocence – is beaten, Flanagan and Cunningham concoct a means to separate the brothers, and attempt to get the truth from Ciaran, using any means necessary, despite the fact that it puts both women at odds with their superiors, and sees Flanagan playing dangerously close to the edge of breaking the law herself. Those We Left Behind, the latest novel from Northern Ireland’s own Stuart Neville, reintroduces us to Detective Chief Inspector Serena Flanagan, who we first met in Neville’s previous novel, The Final Silence. Along with the shift from his long-term series stalwart, Jack Lennon, there is a subtle change in tone in Neville’s writing towards psychological thriller, and marks Those We Left Behind as the first of his Belfast-based crime novels not to feature a heavily sectarian slant. In some ways, this mirrors the changing nature of crime in Belfast itself, as the city continues to try to distance itself from the stigma of the so-called Troubles. Despite the short period of time that has passed since the events of The Final Silence, we find Serena Flanagan a very different person. We meet her as she returns to work following surgery to combat breast cancer. Flanagan’s career progressed in a time and a place where it was difficult enough to be a police officer, let alone a female one, and we see some of this as she readjusts to her job, and deals with the reactions – and obvious discomfort – of her mostly male colleagues. Neville also gives us a view into her family life, and the impact the cancer and the ensuing surgery has had on her marriage. It is little wonder, then, that she has changed so much in such a short period of time. She may be less sure of herself than was her previous incarnation, but we get a deeper insight into the character as the novel progresses, a fleshing-out that was necessarily missing from before, leaving no doubt that Flanagan is Neville’s finest creation since The Twelve’s Gerry Fegan, a complex, layered character about whom we still have much to learn. Intertwining the narrative with occasional flashbacks, Neville shows us how the relationship between Flanagan and Ciaran develops, from their initial meeting during the investigation into the murder of his foster father, through to his current obsession with her. Despite the fact that the novel has a number of viewpoints – mainly Flanagan, Cunningham and Ciaran – the author manages to maintain suspense throughout, making the reader feel almost as if they’re inside Flanagan’s head for the duration. The violence, when it occurs, does so off-stage, leaving both reader and investigator to piece together the clues and come to their own conclusion. Whether it is the right conclusion remains in doubt until the story’s thrilling climax, a testament to Neville’s abilities as a plotter and storyteller. Through all this, we watch as Flanagan deals with the aftermath of her illness and surgery, and its impact on her life, both personally and professionally. In one subplot, both these worlds collide with a bang, and we, as readers, find ourselves completely invested in Flanagan’s reaction, her need to meddle in a case that has nothing to do with her, but which affects her on a personal level. Throughout, Neville manages to find the right balance between examining the impact, and keeping the story moving. As with his previous novels, Belfast plays a key role in the story. Here the author widens his scope, and takes the reader on a whirlwind tour of Northern Ireland, from Flanagan’s base in Lisburn, to the Serious Crime Suite of Antrim Police Station, to the seaside resort of Newcastle. Neville relies heavily on the geography of these places, giving the story a very definite sense of location and imbuing it with a distinct flavour of Northern Ireland. With Those We Left Behind, Stuart Neville leaves behind the crimes of post-Troubles Belfast, and focuses on the everyday crimes of a growing, maturing city. A masterwork of misdirection, this is a well-written novel by an author who seems to have found his groove, producing novels that are more challenging for both himself and the reader with each consecutive release. 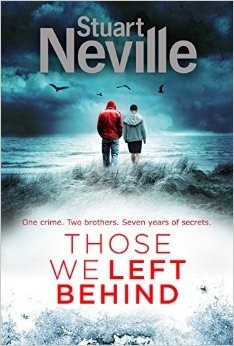 Stuart Neville is at the forefront of the Irish crime fiction movement, and Those We Left Behind is an excellent example of why that’s the case. The perfect jumping-on point for new readers, this is also a very welcome addition for long-time fans, and will leave both groups crying out for more: more Stuart Neville; more Serena Flanagan.